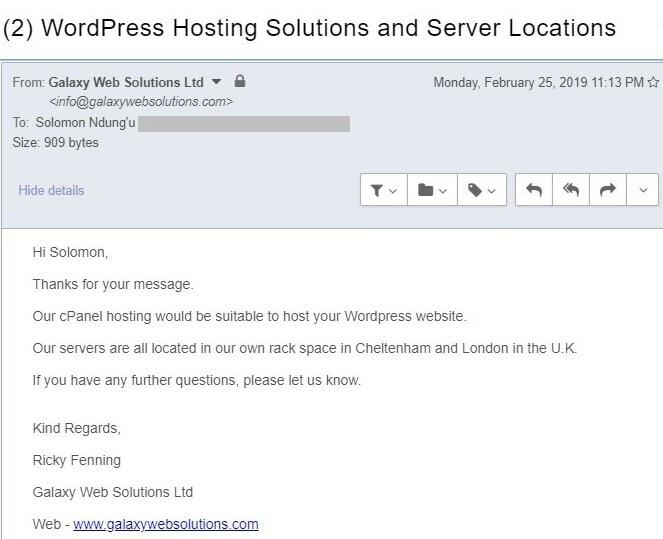 Galaxy Web Solutions Review 2019: Is Galaxy Web Solutions a Good Hosting? Galaxy Web Solutions Ltd is a privately owned limited company based in Bristol, United Kingdom. Established in 2004, the vendor owns and manages its own servers, therefore providing high availability and reliable hosting solutions to businesses of all sizes across the U.K.
Galaxy Web Solutions Ltd is a U.K. based limited liability hosting company. Established in June 2004, the hosting company boasts a client base of over 1,000 customers made up of individuals, SMEs, and large corporations, as well as web developers. The vendor has data centers in Cheltenham in the United Kingdom from which it offers shared web hosting, reseller hosting, domain name registration, and SSL certificates. Galaxy Web Solutions servers are housed in Tier 4 data centers located in Cheltenham and London, U.K. The servers are powered by Intel Xeon E3 CPUs with Hyper-threading and Turbo Boost, 32GB DDR4 RAM, and SSDs in RAID10. What’s more, the hosting firm uses LiteSpeed web servers that combine cutting-edge technologies such as load balancer, cache solutions, and web serving. This offers high service availability and faster loading speeds for the websites it hosts. It is worth noting that, unlike many hosting providers in the market, Galaxy Web Solutions fully owns and manages all its servers in its own private rack space. The servers are managed both on site and remotely via the vendor’s KVMoIP hardware. This gives the hosting provider an edge on delivering high uptime and excellent services. The cPanel web hosting package is this vendor’s most basic hosting plan. It is ideal for small websites and is divided into four plans: Pluto, Venus, Neptune, and Jupiter. Pluto is the starter plan and comes with 5GB disk space, 50GB monthly bandwidth, and 25 cPanel accounts. Jupiter is the premium cPanel hosting plan and comes with 50GB disk space, 500GB monthly bandwidth, and 150 cPanel accounts. Galaxy Web Solutions performs daily backups for its client’s website data. These backups are then stored on local and remote servers for 90 days. This means that, in case of a disaster, clients can retrieve and restore their website data for the last 90 days. Galaxy Web Solutions hosting plans are quite expensive, especially given that the hosting plans only include basic features for hosting personal blogs and SMEs. The vendor’s hosting solutions come with flexible payment plans. Users can subscribe to these plans on a monthly, quarterly, semi-annually, and annual basis. The annual subscriptions offer a discount of up to two months of free hosting. What’s more, Galaxy Web Solutions offers a 30-day money-back guarantee and a 99.9% uptime guarantee. Clients can contact this vendor’s technical support team via telephone, email, or ticketing system. Although there is a mention of live chat support, I did not see it online at any point. While the vendor does not offer 24/7 support, client messages sent between 8:00 a.m. and 10:00 p.m. GMT – the vendor’s support hours seven days a week – get responses pretty fast. I sent them a support email and received a response in less than 10 minutes. Galaxy Web Solutions has put up a fairly detailed knowledge base on its website. For the more than 15 years that Galaxy Web Solutions has been offering hosting services, it has established itself as a serious brand in the industry, delivering excellent hosting to U.K. businesses of all sizes. Its highly responsive support team, excellent remote backup, and modern hosting infrastructure are some of the reasons that many businesses in the U.K. and beyond prefer this vendor. 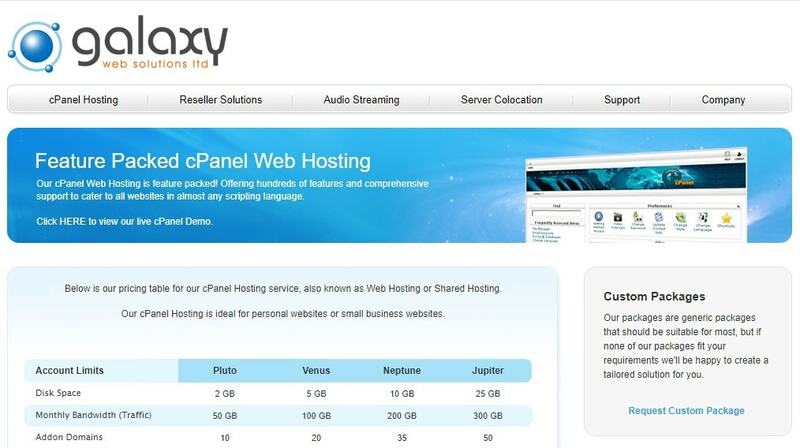 Wondering how Galaxy Web Solutions stacks up against other Web Hosting companies? Enter any other Web Hosting company and we will give you a side-by-side comparison.